Anger motivates change. Donald Trump isn’t the first President who formed a coalition driven by discontent and frustration. The U.S. was born in discontent. The U.S. Declaration of Independence expresses aspirational anger. The Declaration explains our resolve to dissolve bonds and sever relationships. But dissolution is never sufficient. The deeper challenge of leadership is doing something productive with a coalition formed by disconnect. Leadership might begin with destruction, but the real work is construction. We’ve all seen anger-movements in organizations that build coalitions based on severing relationships. Bleeding hearts that gather a following because established leadership is cold hearted. Enlightened circles of genius who know better. Rebels who resist distant authorities. Sometimes the gossips, bleeding hearts, geniuses, and rebels are right. But it takes a dream to build a future. The Colonies framed and signed the Declaration in 1776. Ten years later they gathered to craft the Constitution. 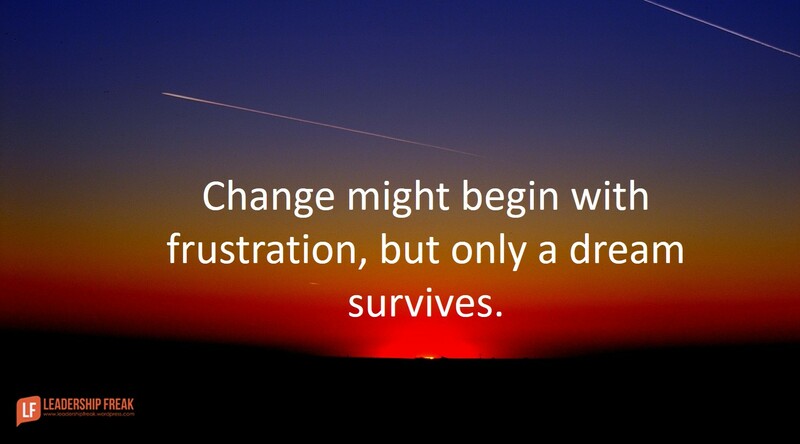 Change might begin with frustration, but only a dream survives. I’ve seen many angry leaders. Only those who channel anger toward positive ends thrive. Success requires a dream that inspires resolve, courage, and grit in true believers. Hammer out a dream that transforms anger to commitment. How will the world be better if we succeed? It’s easy to point out what’s wrong. What will you make right? How will we find our place in the dream? Everyone wants to matter. How will we interact with each other while we fulfill the dream? Values and structure protect and channel energy. Spend most of your time talking about ‘better’. Complaining isn’t forward-facing leadership. Fuel believers. Avoid the tendency to focus on resistance. Respect and honor the troops. Convince skeptics. Focus on those who share your values. Those who don’t share your values will always resist, even if they go along. How might leaders make frustration productive? Change is the first step of inviting frustration, gossips, blame games etc. True leaders do not afraid of such deviations. They know, it is natural to have such reactions. And you have rightly mentioned that ” Success requires a dream that inspires resolve, courage, and grit in true believers”. Leaders know how to resolve such syndromes. They take long everyone with their inspiring behavior. There is a saying ” there is victory after fear”. And when frustration is natural when people have fear of any/many kinds. Here comes the role of leaders. Leaders address the fear of people and encourage them for efforts and direction. They connect their dream with all. They create environment when everyone owns the dream. And this is how leaders create winning team. Thanks Ajay. Your inclusion of fear in this conversation is important. It seems like fear and anger are connected. When used well, they expand the journey. When used poorly, they shrink us. THAT is the environment for positive change that will take on a life of its own, and gain momentum. Thanks Lori. Great of you to drop a note. Happy 4th to you, too. Convince skeptics, not bully them. Focus on facts and information, not lies and distortions. Focus on honesty and openness, not secrecy and deceit. Can you image, “The Leadership Secrets of Donald Trump” appearing on anything but The Daily Show or The Onion? Leaders should involve and engage people in a shared vision and move forward in a specific direction. They should protect values like Democracy and not try to demagogue their way into a dictatorship where they listen to no one but themselves and operate in their own best interests and not with an interest of the 99% of the people who make up this country. What is The Dream? To make the land and the society uninhabitable for average people? Scott, read Newt Gingrich’s new book “Understanding Trump” it might give you a different perspective and some insight as to why he is the way he is. The greatest fear Progressive Liberals have right now is that Trump’s leadership will actually Make America Great Again! Why do you think they and the MSM are fighting him so much. When Trump succeeds, it is game over for the Progressive Liberals and I would imagine several MSM outlets. Happy Fourth! “Listen and adapt”, soon you will see the advantages, you still need everyone on the same page. The constant battle for everyone to work together seems timeless. Their will always be resentment in some shape or form, just because they can. Wow!!! So powerful, straightforward, and uncomplicated. Whether you wrote this with the POTUS in mind, he would benefit along with all of us if we concentrated on the dream! Great post, Dan. It’s time that we all realised that change is, more than anything, a social phenomenon full of subjective beliefs, values, and attitudes… not an intellectual pursuit that has objective facts and information as its foundation. This is nothing new…”get your facts first, then you can distort them as you please” Mark Twain. Reminds me of ideas I try to remember in all that I think, say, and write: Focus on what I’m FOR more than what I’m against. Also, aim my message to the early adopters before the majority. Treat everybody with respect and listen to their stories with understanding, and relate my cause to what’s relevant for them. Always find the connection and start there!! Best wishes to you this holiday, Dan!